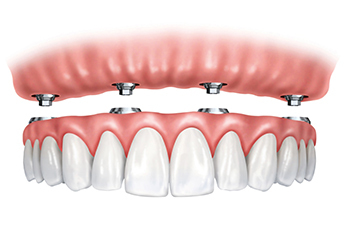 Can just four implants replace all of the teeth on the top or the bottom of your mouth? Thanks to advances in dental implant technology, that answer is a resounding yes. Believe it or not, tooth loss is extremely common among adults, especially as we age. In fact, more than 35 million people in America are missing all of their upper and/or lower teeth. Rather than living with the discomfort and hassles of dentures, many people are opting for what is called “all-on-four” dental implant restoration.